Some restaurants might regard a restriction of available seating in a restaurant to just 26 a severe limitation. Armando Tommaso, owner/manager of Restaurant 22 has made it into a true benefit. 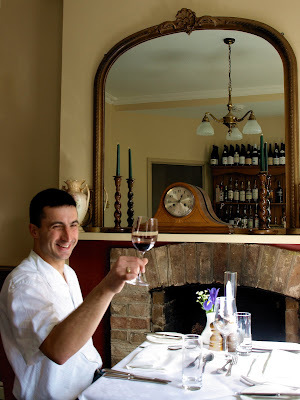 I dashed out of the rain on a March morning and into an intimate small Victorian house at the bottom of Mitchams corner in Cambridge to find out more about Armando and his successful restaurant. Armando took over Restaurant 22 in 2007 with the objective of providing good quality modern European food based on recipes from France, Italy, Spain and the UK, with a set price, three course menu. Because of the limit on the number of tables and the need for prior booking, Armando was also able to provide a more personal service to clients from Cambridge and the surrounding areas, distinct from the tourist based services in the City itself. Professionals and academics are a part of his regular and returning clientelle who are kept in touch with the offers and menus available throughout the year through the e-mails sent to friends of the Restaurant. Indeed, regular bookings were being phoned in during our conversation, attesting that even in a recession, a good business model can help you survive! Our conversation turned towards possible expansion into providing a lunchtime option. Within easy reach of the Science and business parks and other professionals, particularly in the north of Cambridge, the venue is particularly suited for advanced booking by small parties of 6 or more wishing to break up a day of meetings with a good meal in conducive surroundings. One innovative idea was to link with a taxi service to pick people up and drop them back at work again after the meal, neatly avoiding those parking issues in our city. 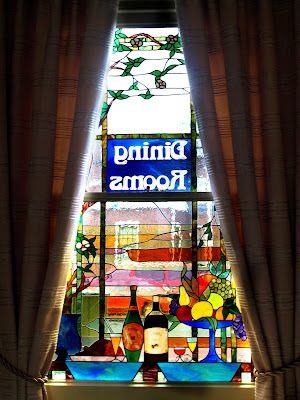 My particular pleasure of the visit was to end it with a photograph of the gorgeous Art Nouveau window decorating the main dining room, which encapsulated the positive impression created by both Armando and his Restaurant 22. I was just looking you up to tell a new contact about what you do and found this charming little blog about what sounds a truly special place to dine.